Well, it’s bank holiday weekend and rain forecast. What are we gonna do? 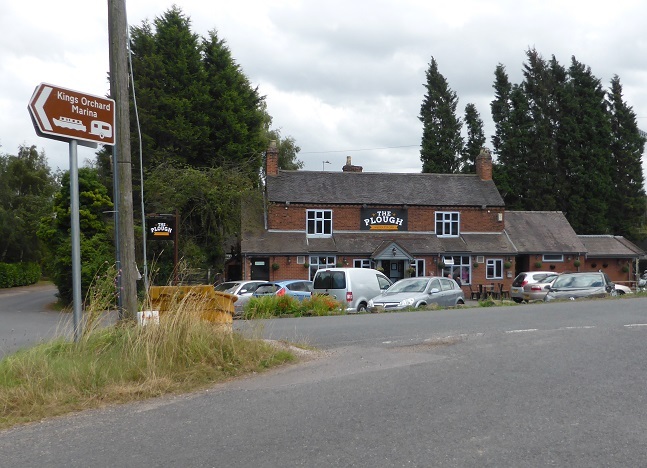 Let’s head off to Atherstone and the Church End brewery’s Tap, only 45 mins away and an easy drive up the A5. 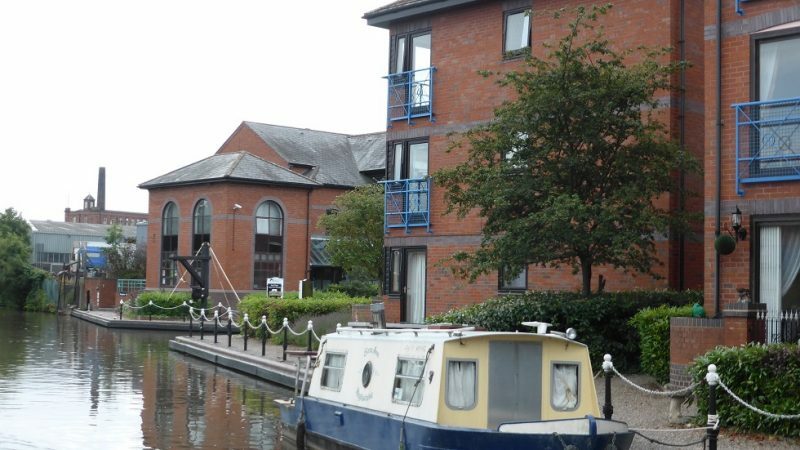 Plus, we can walk Toby on the canal and down past all those locks wot we did! 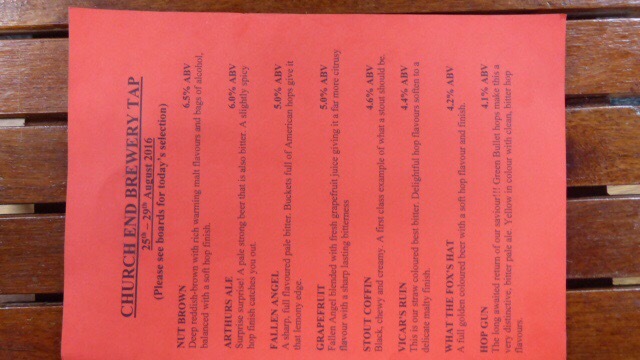 The Tap was not easy to find (CV10 0RD) but was quit a pleasant surprise, a modern place with two bars and a green. 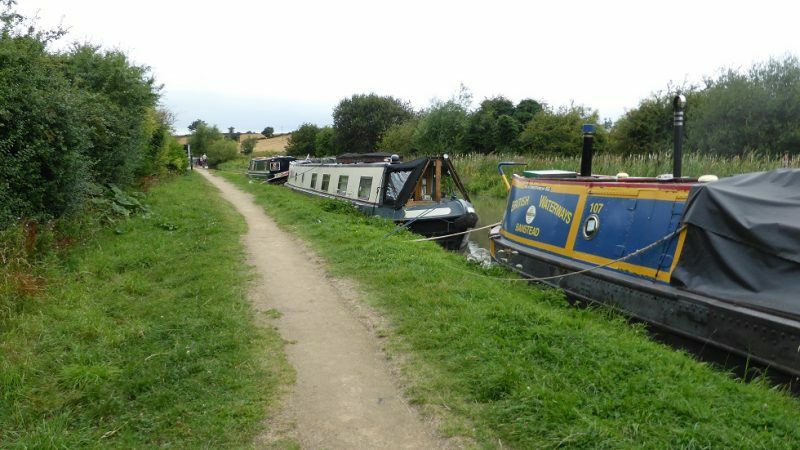 We strolled down the five locks and came across our old friends Leah & Norman on their narrowboat Brindley. We were with them in Liverpool and spent a happy week getting to know them, and they thought they’d got shot of us eh? We hope to see them again soon. And then the forecast proved all too true with 2 hours of torrential rain with thunder and lightning. Yes, every day here is a Saturday to us, except Sundays. Rain today. Which makes a change. But then the sun came out later . . . nice. 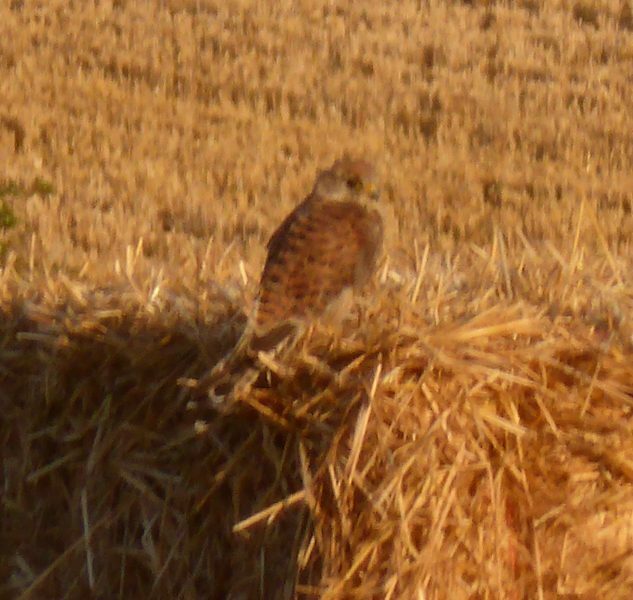 Saw this hawk flying high over the recently cut wheat and then he settled on the corner of the haystack . . .
Phew, ever since we’ve back it’s been Scorchio! 32 degrees in the boat right now. 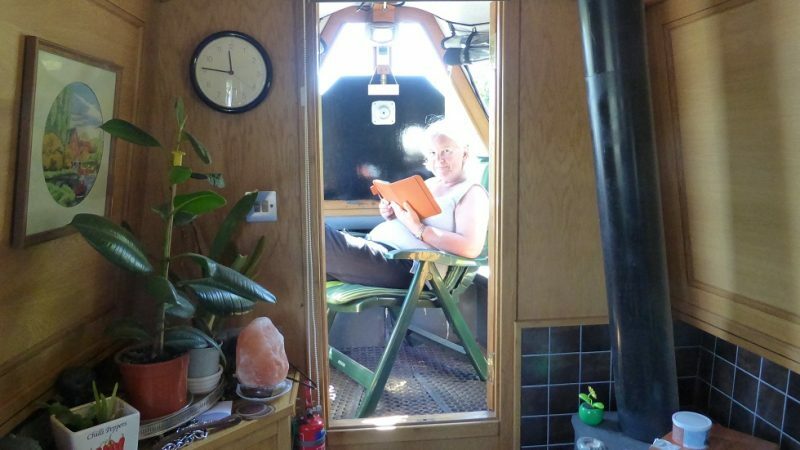 Time to do lots of boat chores, wash the car (3 months of crust), de rust bits of boat, buy stuff – yes, Steve always wanted a sound bar for the TV as he no longer has his hifi on board. So he’s bought this Azatom thing (see Link: http://www.amazon.co.uk/dp/B014O6OHPY) through which we can play the TV as well as stream radio and music via Bluetooth wifi etc. Viv’s got a bread maker coming as we do miss making our own breads. 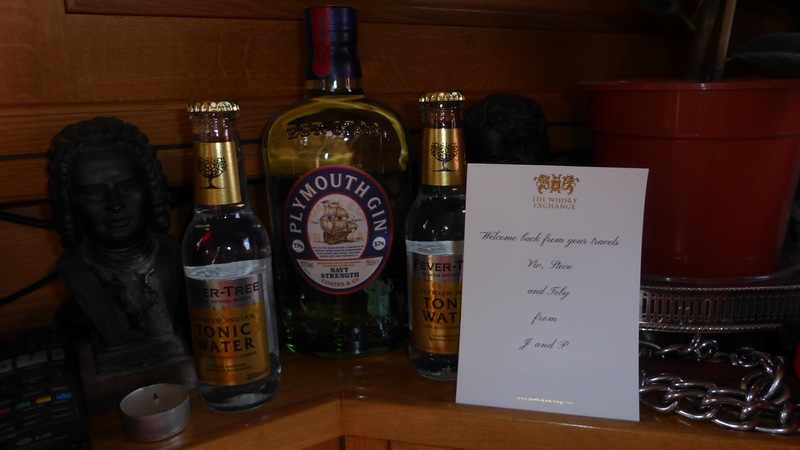 Another arrival was a strange box from Penny & Jenny – Plymouth gin and tonic! What a nice home coming present! Back before midday! The wonderful marina manager, Neil, was there to greet us. Well, to take £133 of us for fuel, pump out and cards for the electric! Everyone was keen to ask how we’d got on. Which was nice. Absolutely shattered now so time to do a very small amount of essential boat stuff then . . . take it easy. The end of the odyssey for 2016? 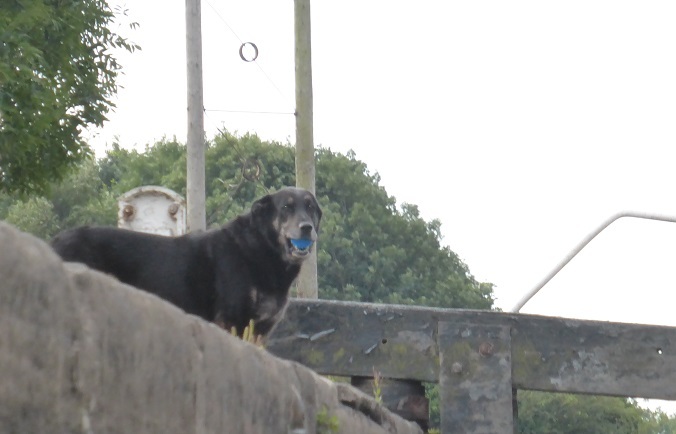 Day 70 – Up the (Norton) Junction! 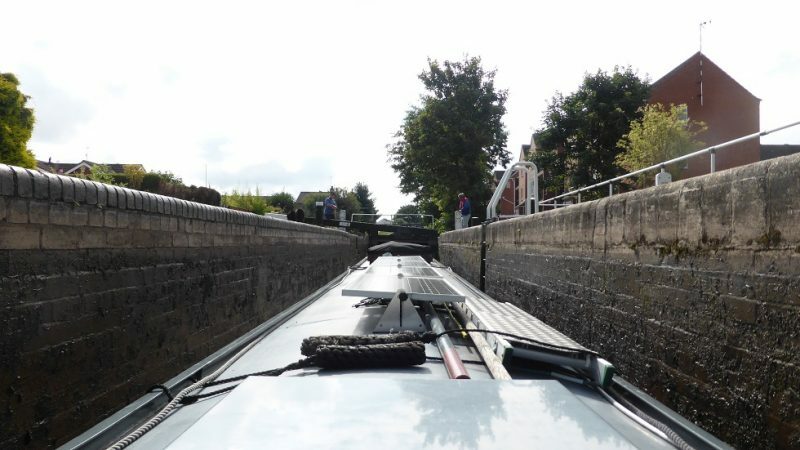 Bimbling through Braunston. Bracing up in the 6 big locks. Terrifying through the tunnel. Muppet hirers going soooo slow we kept losing way. 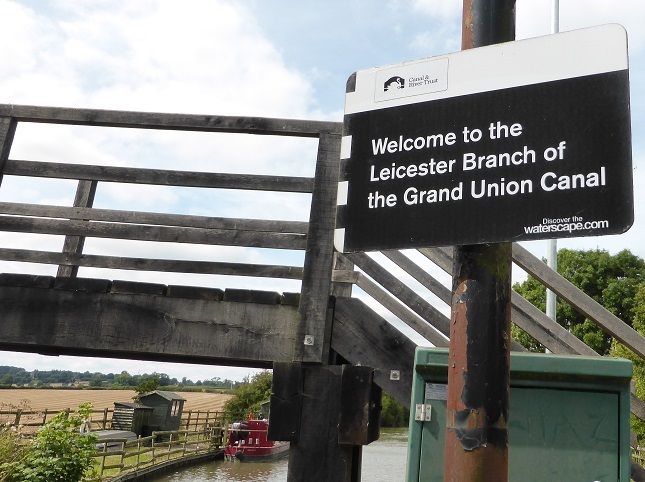 Then into Norton Junction, past the network’s smallest welcome sign . . that’s it. 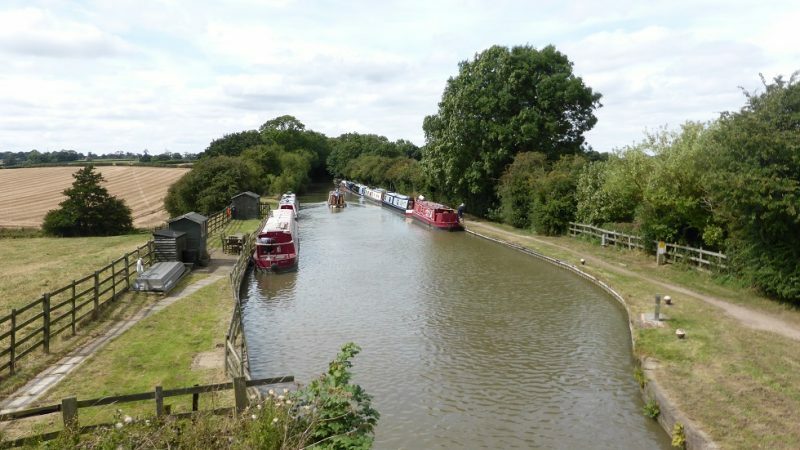 Six miles, six locks and one long (2042 yds) tunnel – enough, let’s moor here. Just a 40 minute chug to the Watford flight (mind the gap!) and then home . . . If you don’t turn left here, you’ll be on the way to London! 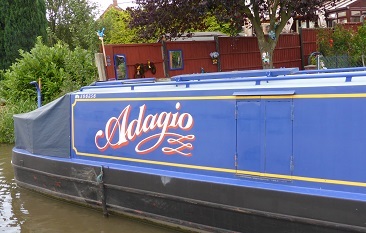 Here’s Adagio . . 3rd along. Some nice boaters on Alpenlode and Serafina. 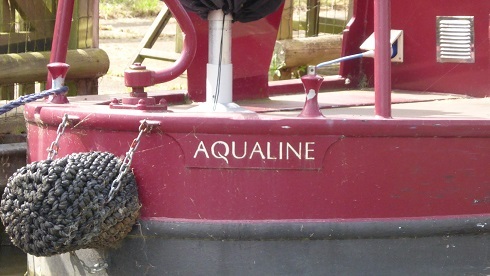 Same shot, zoomed out . .
Another Aqualine boat – must get one of those signs! 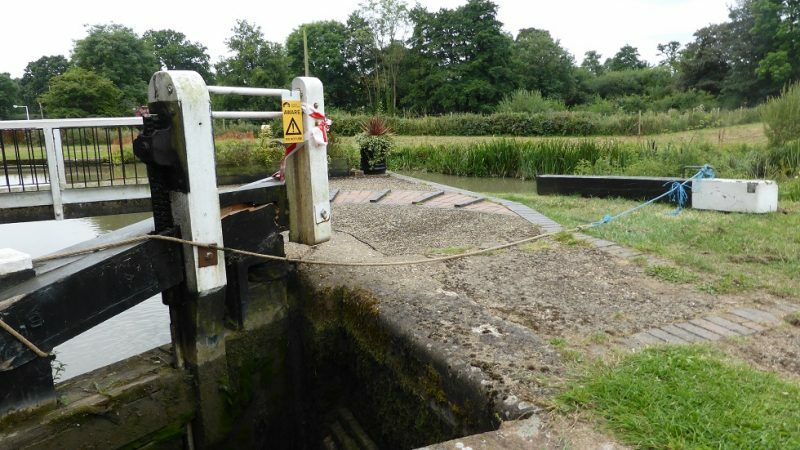 We only wanted a short trip today so only 6 miles and 3 locks at Hillmorton, which went very smoothly, now that the duplicate locks are all in good working order. 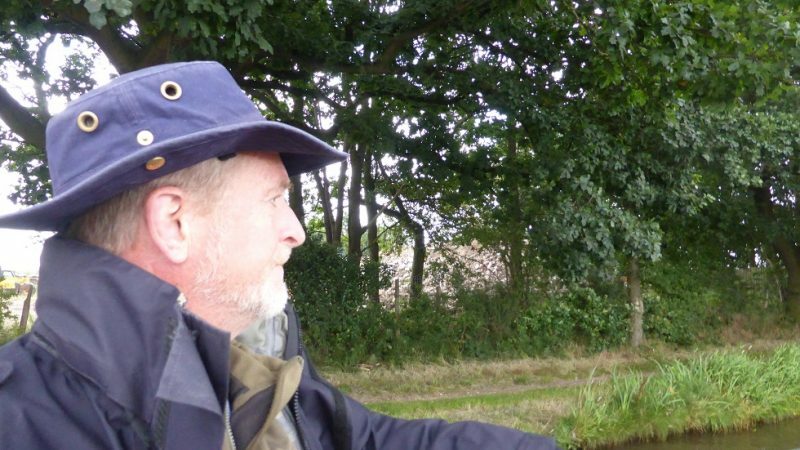 Unfortunately Steve’s hat got lost – did it blow off, drop in to a lock or was it nicked? Dunno. This is the second cap to go missing . 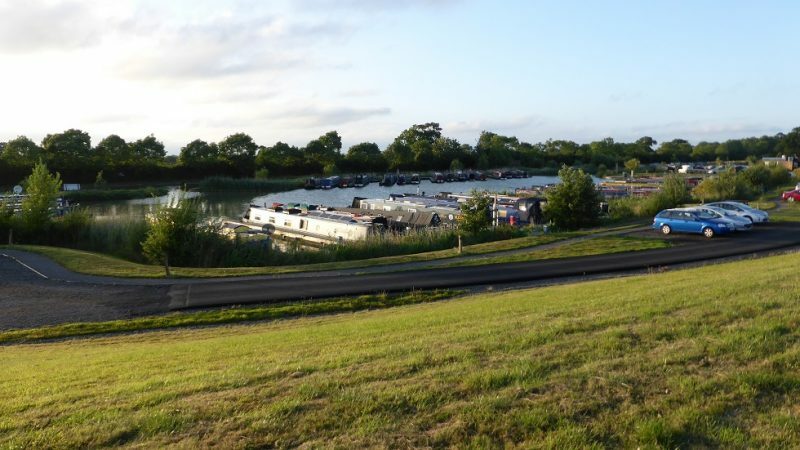 . .
A big board advertising yet another marina, just a few miles away from Braunston. 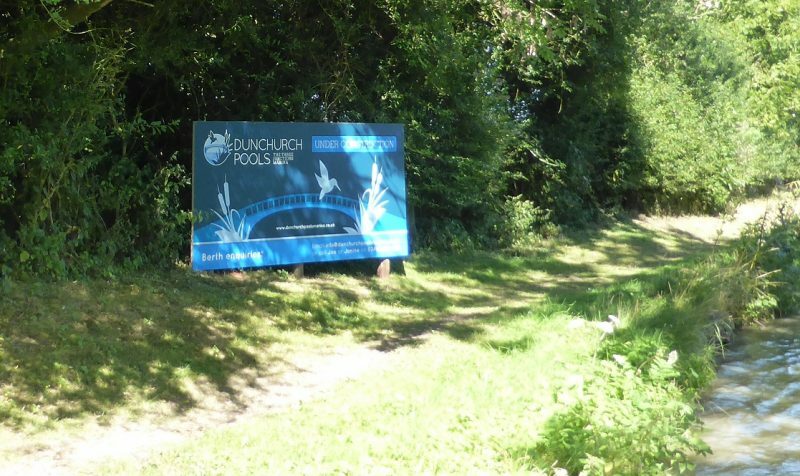 Dunchurch Pools. 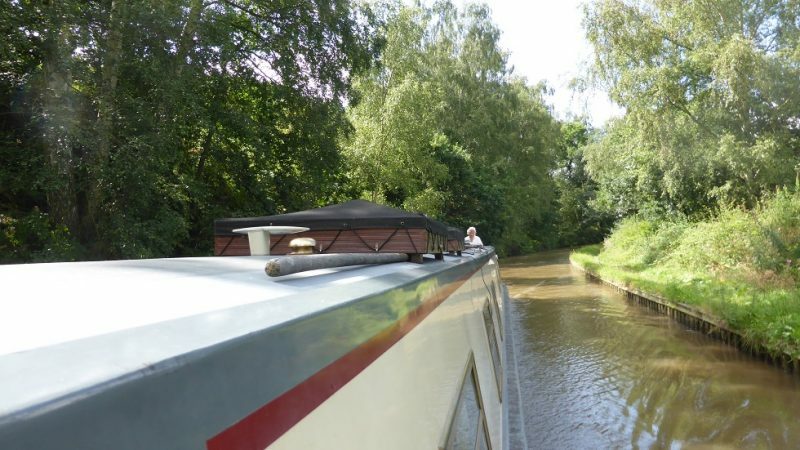 It’s a lovely stretch and the complete opposite to the buzz of Braunston. A lazy start, 10 o’clock , off to Hillmorton. 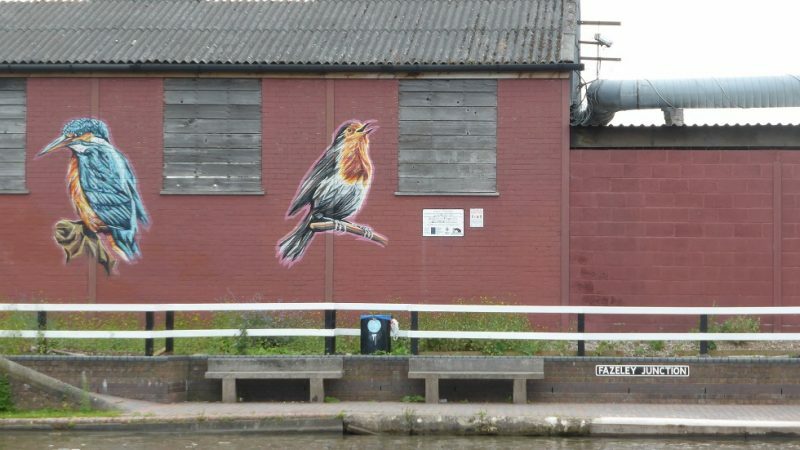 We skirt around Coventry and then skirt around Rugby. We said Hi to David Johns, now ensconced in Clifton Wharf, doing his video work. 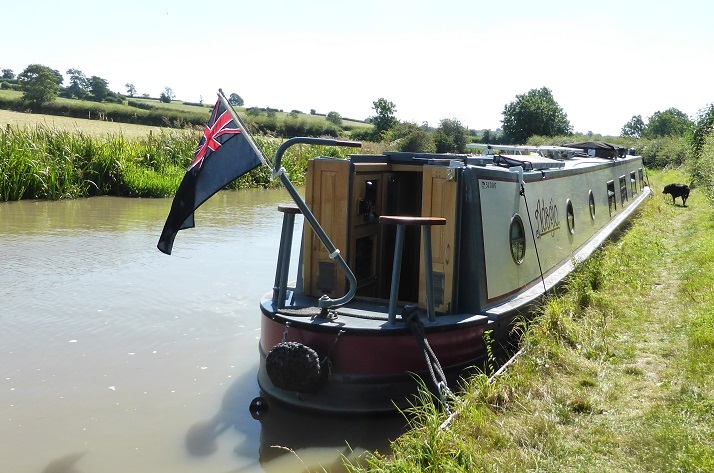 Finally moored up at the lovely Hillmorton visitor moorings. 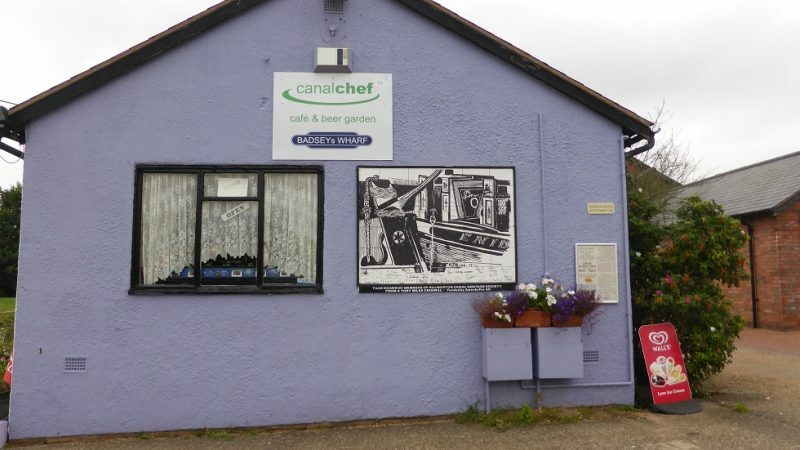 We popped into the cafe, a quaint piece of canal history that serves Church End beers! Only a few days left. The whole trip will work out at 417 miles and 206 locks, all at 3 mph, or less! 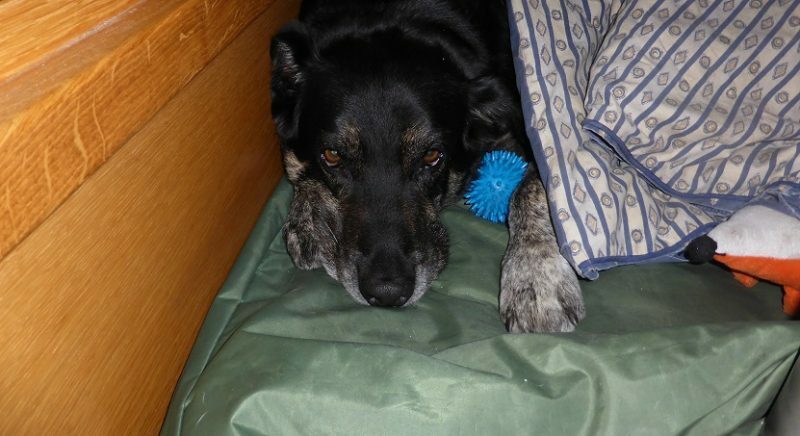 I think Toby wanted a duvet day – no chance . . 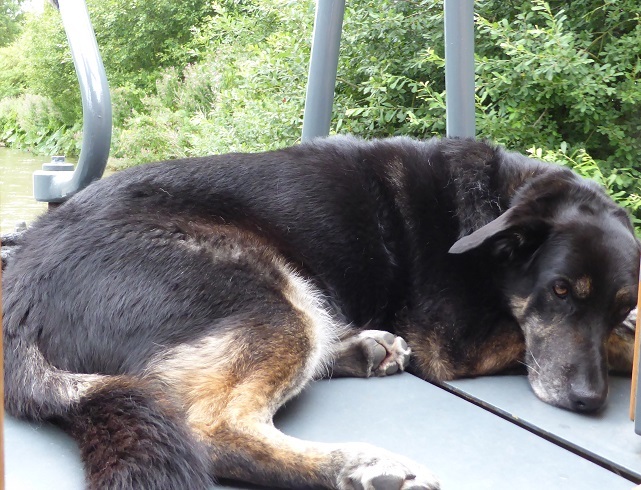 But he is getting more bold – actually sleeping on the stern! 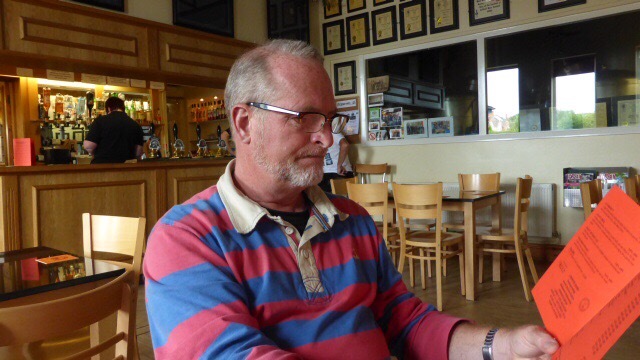 And who should we espy at Clifton Marine – one vlogger himself, David Johns. 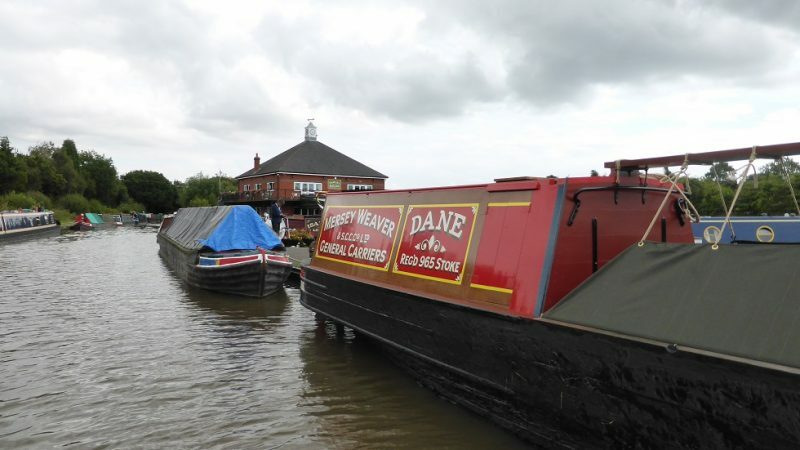 Not too busy – the delightful Hillmorton visitor moorings. 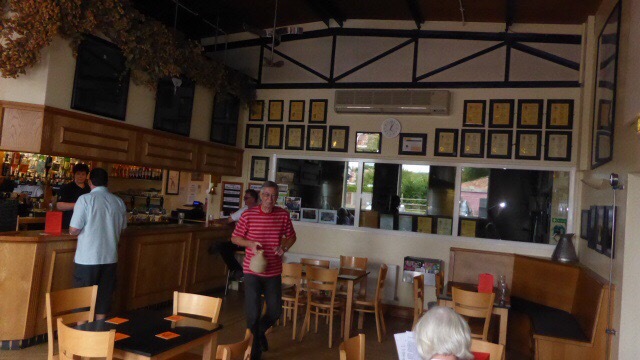 The rather quaint cafe – quite an amazing little place. 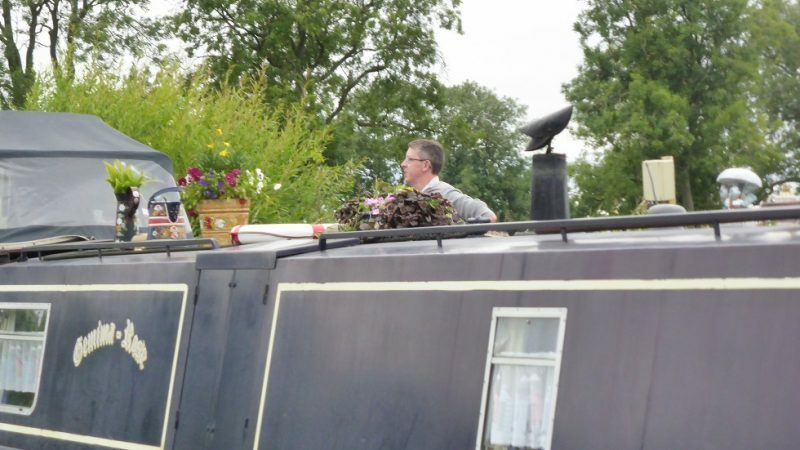 Even though we were moored up beyond two locks, we still had a boat chug by before 0700! 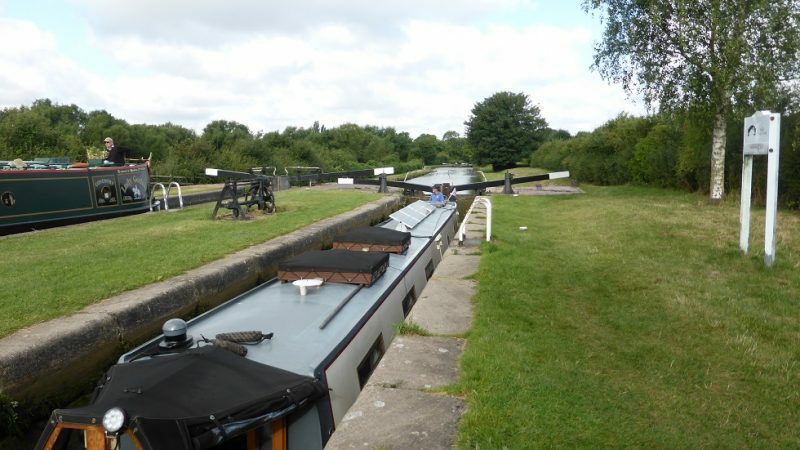 With that in mind and the thought of a queue of boats at all these locks (7 still to do!! ), we got moving by 0800 and up we went. 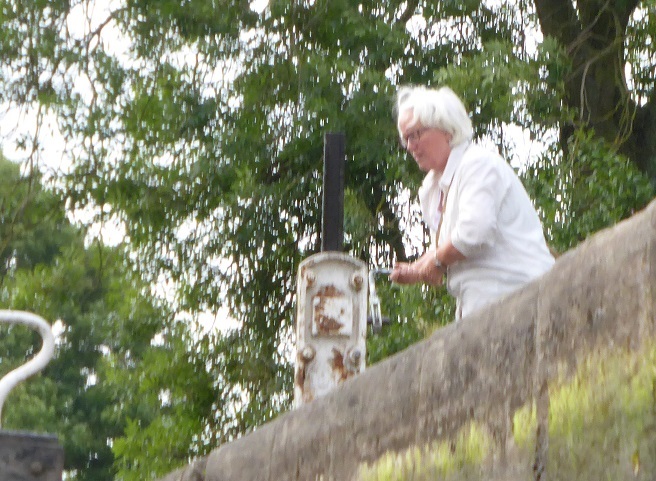 Going up – nearing the top lock with several CRT volunteers – always helps! 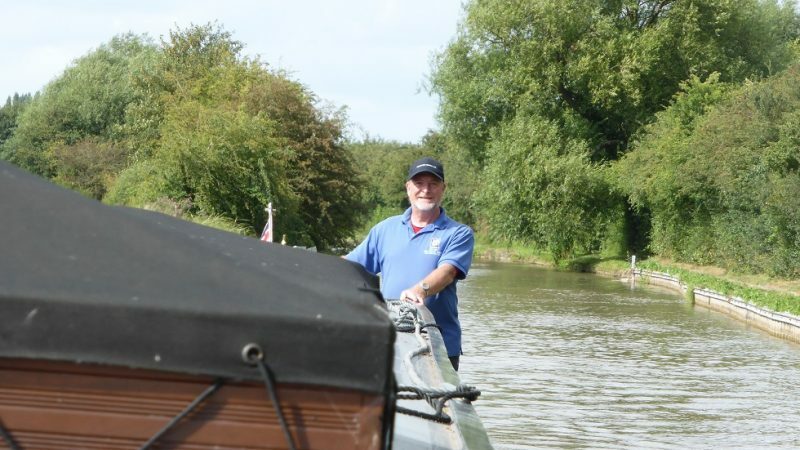 Chatting with the volunteers – Steve’s paddle’s up! 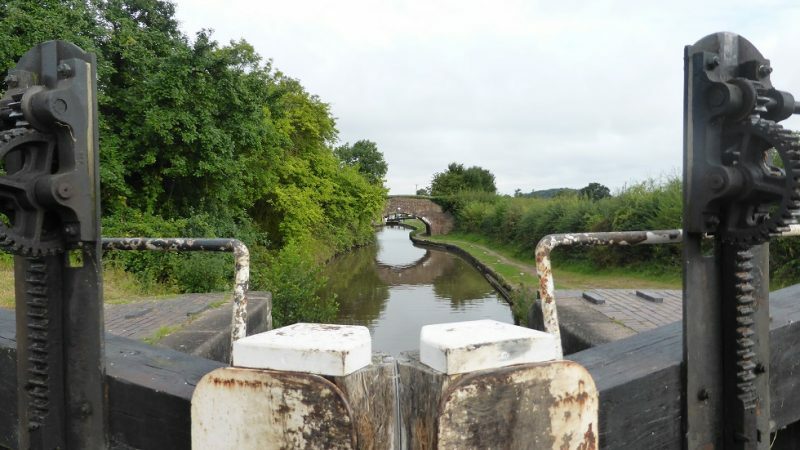 Quite a long day (12 miles and 8 locks), an early start but all done by 4 p.m.
An 0850 start today, aiming to get thru the Tamworth section (Glascote locks) and moor somewhere beyond – maybe even at the foot of the Atherstone Locks. 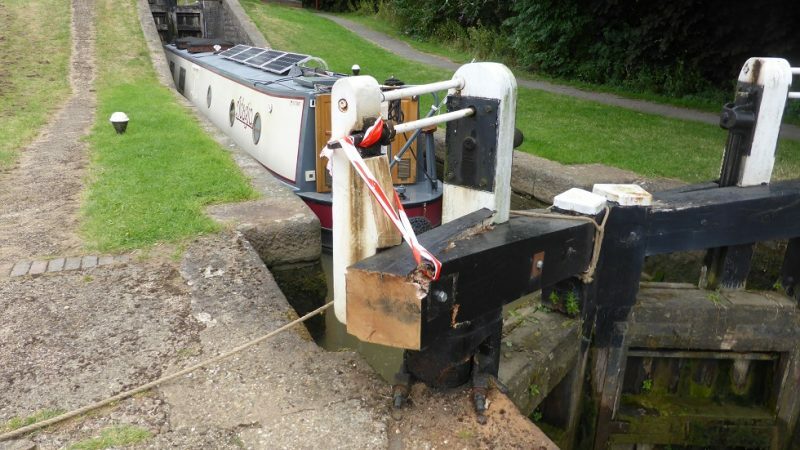 The stern gland is still leaking and provides a constant stress but I pump out the plastic container each day. It probably leaks a few litres a day, which, yes is a few litres too many but we can cope. 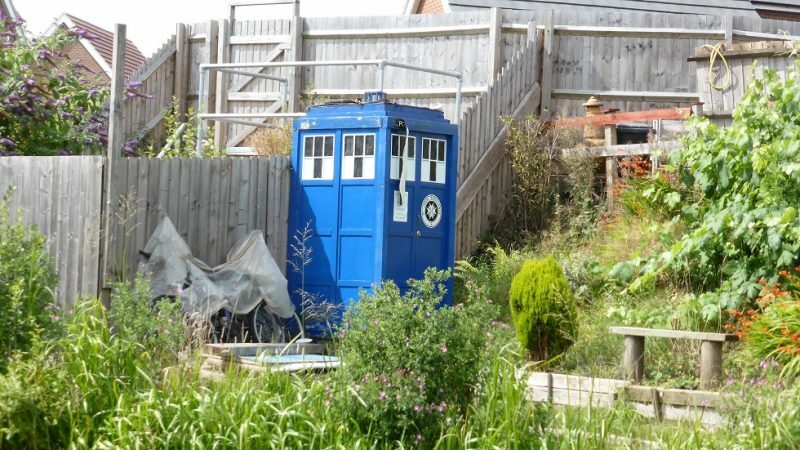 It’s booked in to be fixed next month. 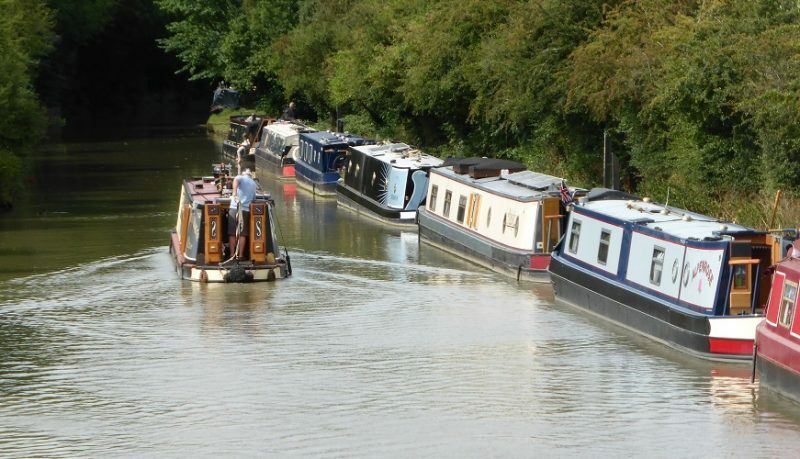 A lot of this boating can be stressful – there are tooooo many boats. Next year we’ll hole up somewhere for the month of August! 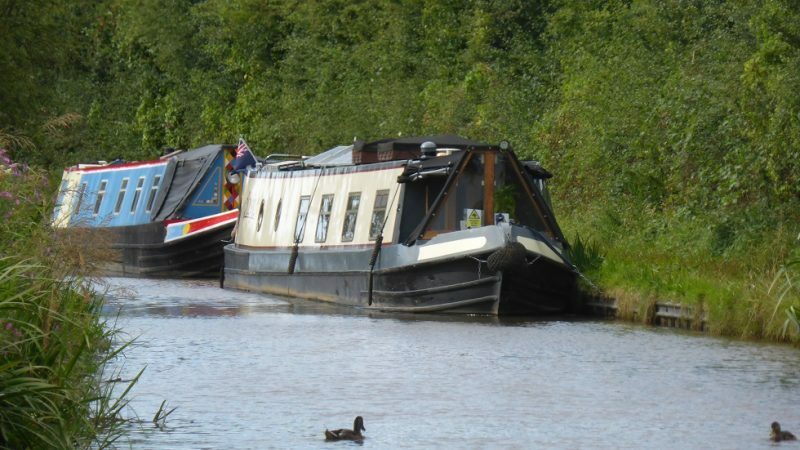 For example, this morning three boats went by before 0730!! 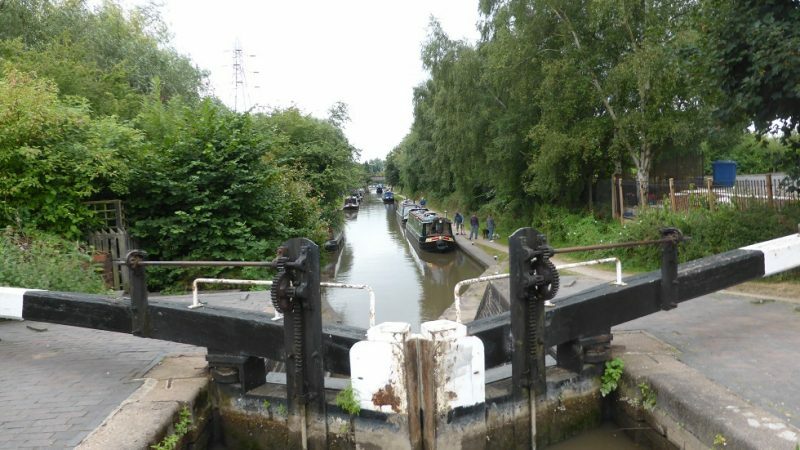 And when we got to the locks at Glascote, we had to wait for 2 boats in front of us but when I looked back 5 more had turned up. And of course they all go too fast. Don’t get me started. #grumpyoldman. 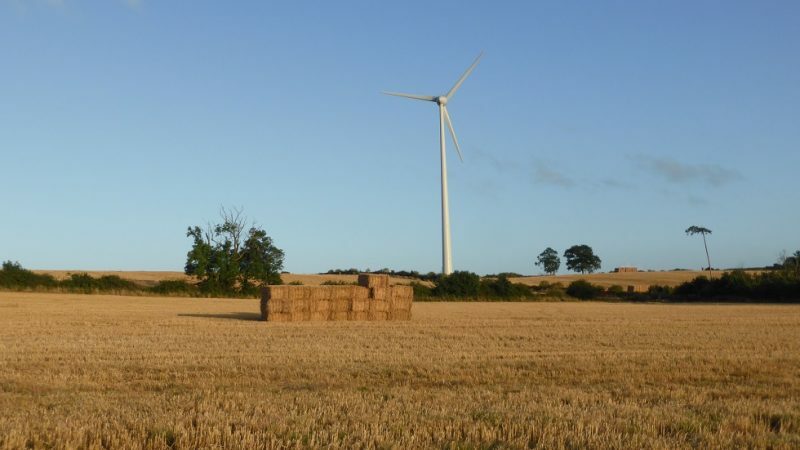 It turned out to be a lovely sunny, cool and windy day. 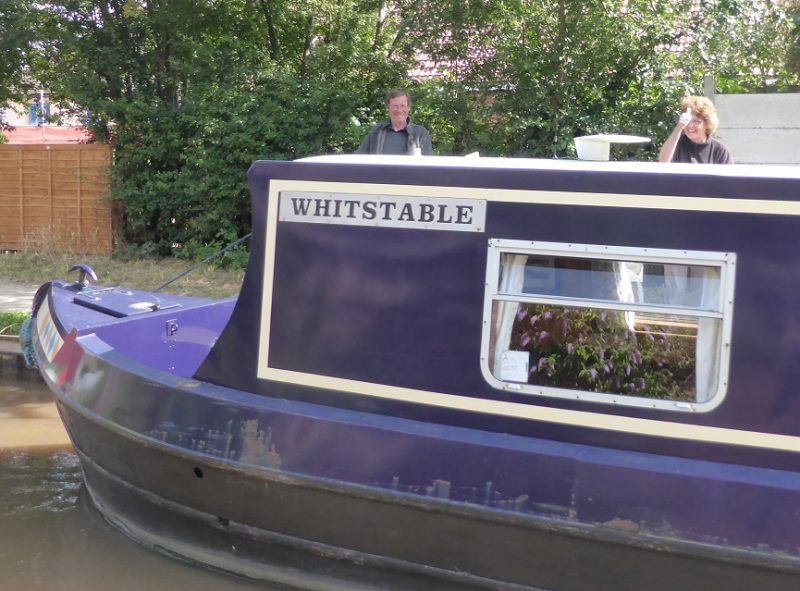 Viv gets to drive for a bit – photo shows how long our boat is! Busy, busy, busy. We got going early but still 3 or 4 boats zoomed off before us. 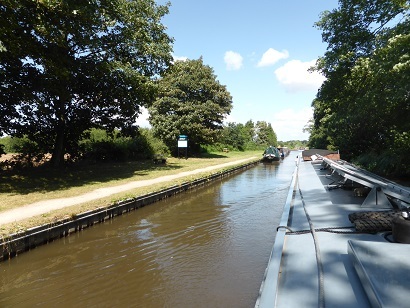 Down thru Colwich lock after taking our turn and on to Rugeley. A very fraught day with high winds and us in low morale – the boat seemed unhappy with problems of shallow waters plus stuff round the prop. So we weren’t happy either. 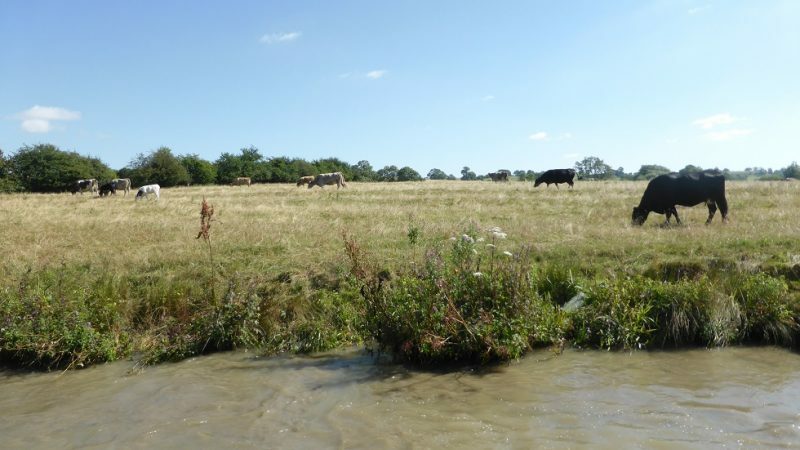 We got very fed up and oncoming boaters every 5 minutes didn’t help. Not a good day. We got very dispirited. 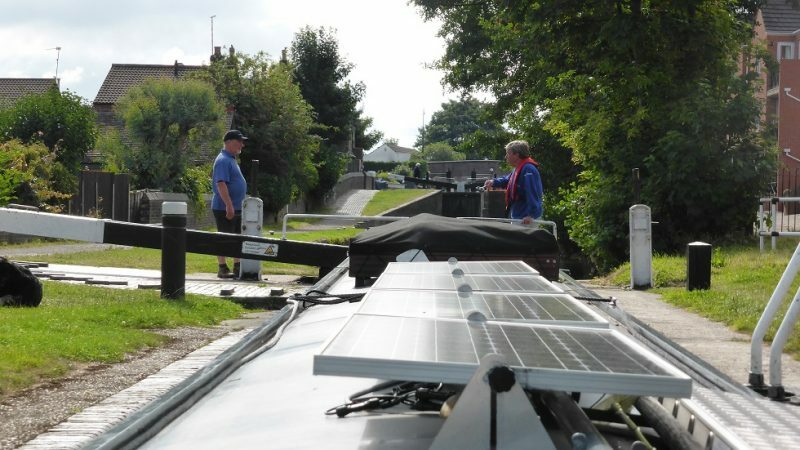 But by the time we got to Fradley junction – the site of a major confluence and usually hours of waiting, we were ushered straight into the two locks by the smiling volunteers, no waiting at all! 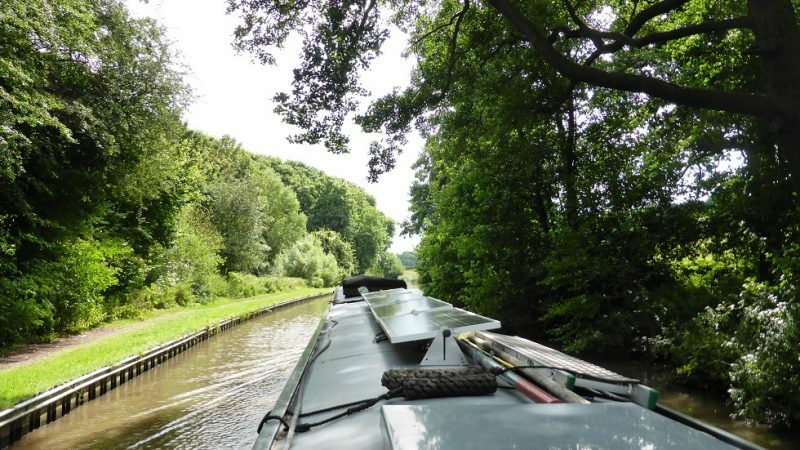 A right angled turn and we were back on the Coventry canal – hurrah. 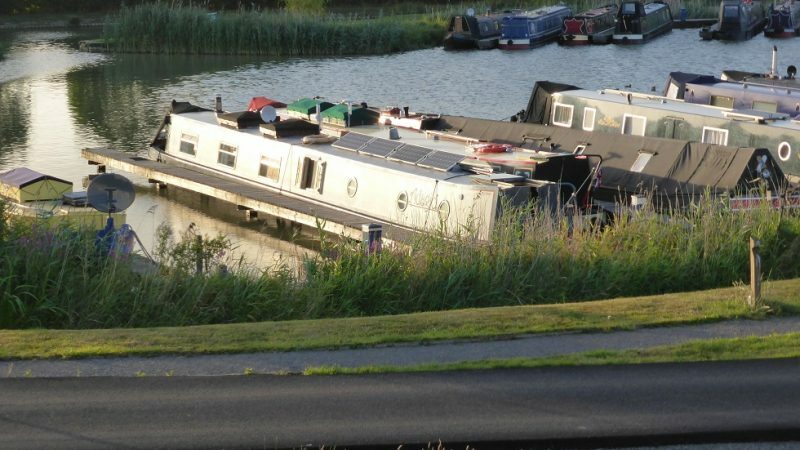 Viv loves this canal as it very scenic, well, some of it is. 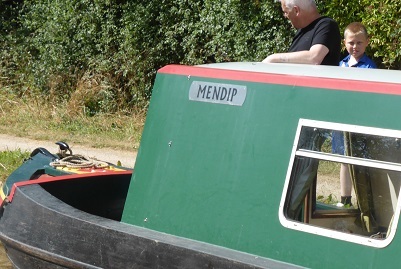 We moored just an inch beyond the junction last time but this wasn’t good – lots of flies and people. 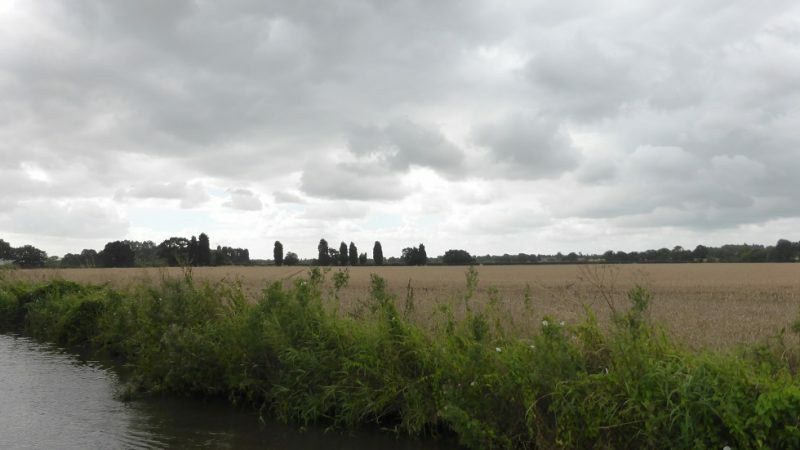 So we chugged on, so 2 hours more, to Huddlesford and the Plough. 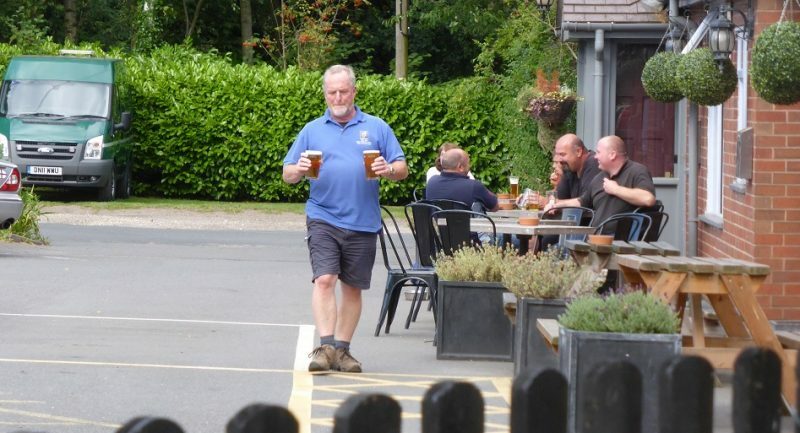 A good mooring and some well deserved beer. 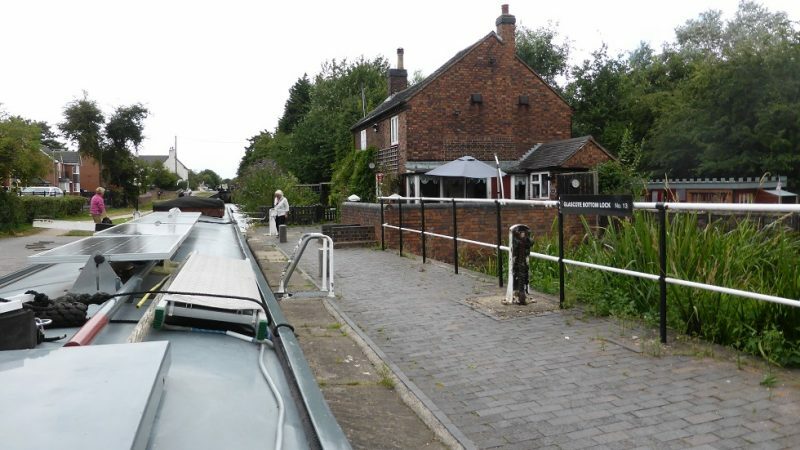 Coming up to Fradley junction and the lock is open and waiting for us! 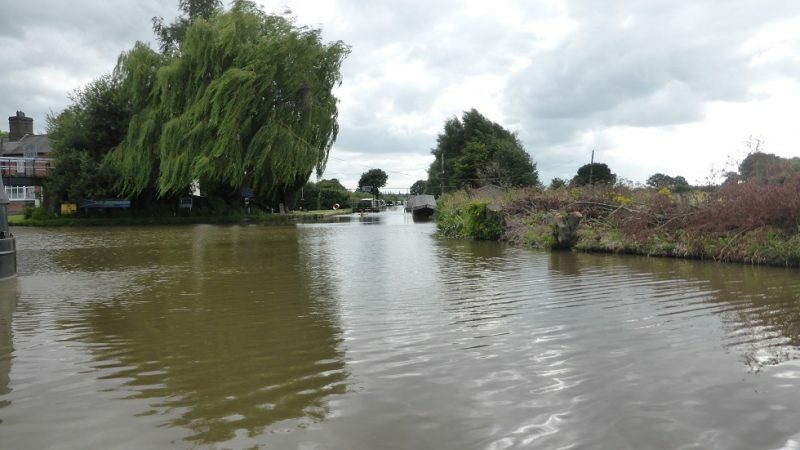 Final mooring – close to the pub! 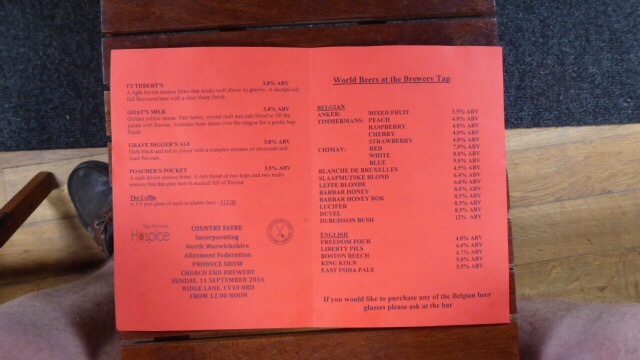 The Plough at Huddlesford – they even had some Church End beer! 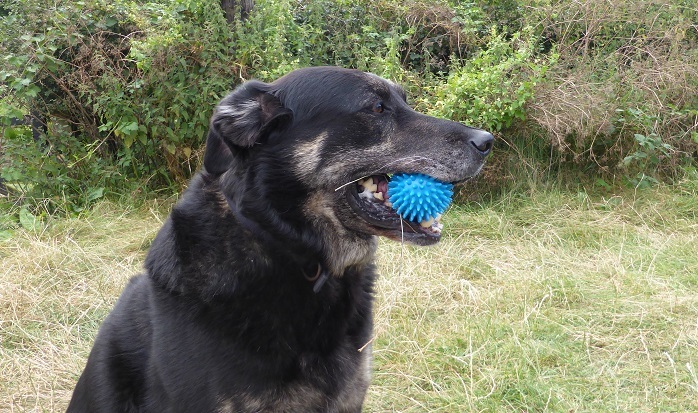 Toby with his new toy – looks like a model prion?